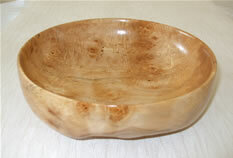 This bowl was rough turned from a large block of un-seasoned Ash during my professional training in October 2007. Often, a project needs to be rough turned into a basic shape to allow the timber to dry out prior to finishing. During this stage, all sorts of movement can (and did) take place. 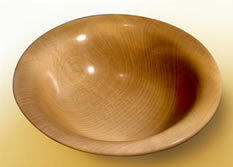 In this case, what was a perfectly round bowl (even though it was still in the rough) became an ellipse measuring 218mm by 230mm. 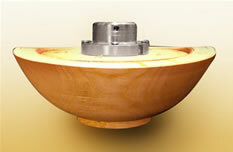 The height of the rim varied between 77 and 88 mm., and the foot diameter varied between 81 and 88mm. 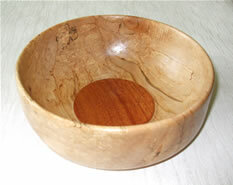 The size and shape of the foot was a major problem, as I could no longer hold it in the lathe. Also, a large quantity of timber needed to be removed from both the inside and the outside to regain the round profiles. A radical solution was decided upon. Having cut and glued a piece of 18mm plywood into the top opening of the bowl, a face plate was then screwed to the plywood, allowing me to turn a new foot and re-shape the outer profile. With that completed I was able to re-mount the bowl using the new foot, remove the false plywood top, and re-turn the inner profile. The final finish was sanding sealer and beeswax. 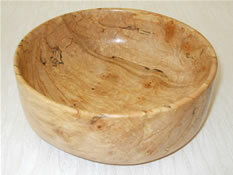 A Spalted Beech fruit bowl, 350mm diameter, and finished with food-safe oils. 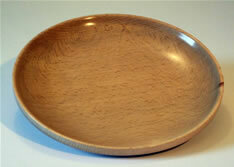 A Beech platter, 215mm diameter, finished with friction polish. 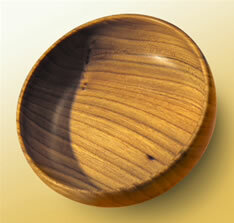 A bowl turned from Sycamore, 225mm diameter, finished with beeswax. 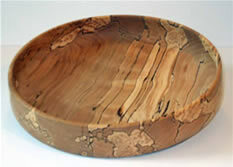 These 3 bowls were all cut from rippled and spalted Maple. 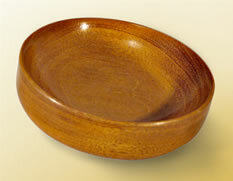 As a trial, one of them was given a Mahogany insert. The finish is nothing more than oil, polished to a high gloss after the final coat had dried. 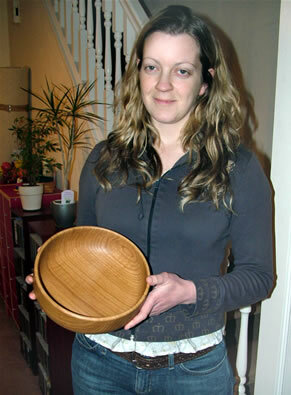 This bowl was created for Jo Mellor with grateful thanks. She did all the original design and development work on my web site. Although the site has now been subjected to much evolution, it was the work which Jo did that showed me the way forward. 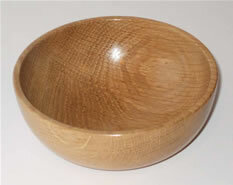 Jo wanted an Oak salad bowl, so a nice blank was selected from Stiles & Bates, and was stored at home for a couple of months to allow it to stabilise. 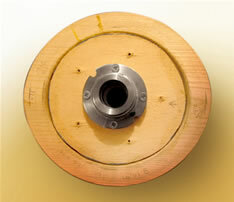 The weight of the original blank was 2.4 kilograms. Job done. 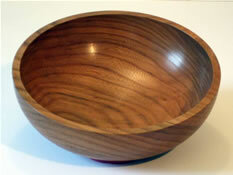 The bowl has been finished with 3 coats of food safe oil. The final weight was 400 grams, a reduction of 2 kilo's. 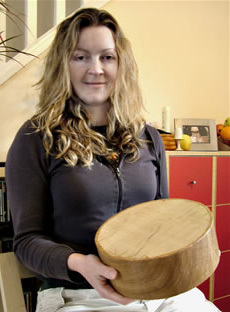 The bowl never actually came into balance, so the blank must have had a dense patch on one side, but it didn't prevent a very nice piece being produced, and Jo was very pleased with the result, as was I.